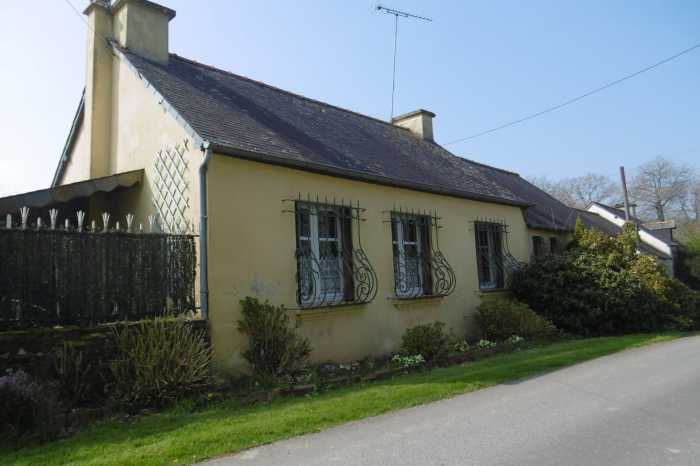 A pretty little 2 bedroom centrally heated cottage, friendly rural location with neighbours. From the photographs you will see that the decor is 1960's and every room will want completely re-decorating and possibly a new bathroom and kitchen although these are quite functional. However its well priced and quite habitable with a good sized level garden. A summary: veranda, entrance hall, dining room, lounge, WC, bathroom. Upstairs two bedrooms. Outside: A well, boiler room/wood store, CH fuel tank covered area, large garage with loft above which may convert to additional accommodation. Large level south facing garden. 1 Veranda 7 m² South Tile Timber & glass construction. 1 Dining room 18.5 m² North Tile Stone fire place with insert wood stove. 1 Kitchen 4.9 m² Tile Compact corner kitchen with hob oven etc. Concrete Laundy area, Stairs to loft space. Covered area for the heating oil tank. Furnished « Furniture - as required », Well.